The Foundation is proud to have provided a grant to help DDHS junior Ester Petukhova and her mother travel to New York to receive this amazing honor. Huge congratulations to Ester, who received high honors at the National Ceremony of the 2018 Scholastic Art and Writing Awards, held June 7th at world-famous Carnegie Hall. Ester earned the prestigious Best In Grade award, given to two artists per grade nationwide, 7 - 12. Her hard work also garnered a Gold Medal and three Silver Medals. Ester was all smiles and big waves as she accepted her award on stage, bedecked with the medals around her neck. Highlights of the National Ceremony included inspiring talks by actor Ansel Elgort (Baby Driver, The Fault in Our Stars,), writer R.L. Stine (Goosebumps) and children's book author/illustrator Marc Brown (Arthur). After the ceremony Ester was swept off to a VIP reception with donors and top medalists. Beaming Mom accompanied Ester on her Big Apple adventure, which included college tours and a most magical trip to the Metropolitan Museum of Art. (A love of art runs in the family!) Ester's attendance at the Awards' Maker Prom was also a highlight. This festive event was held at the historic Roosevelt Hotel and featured professional dancers and art making stations. 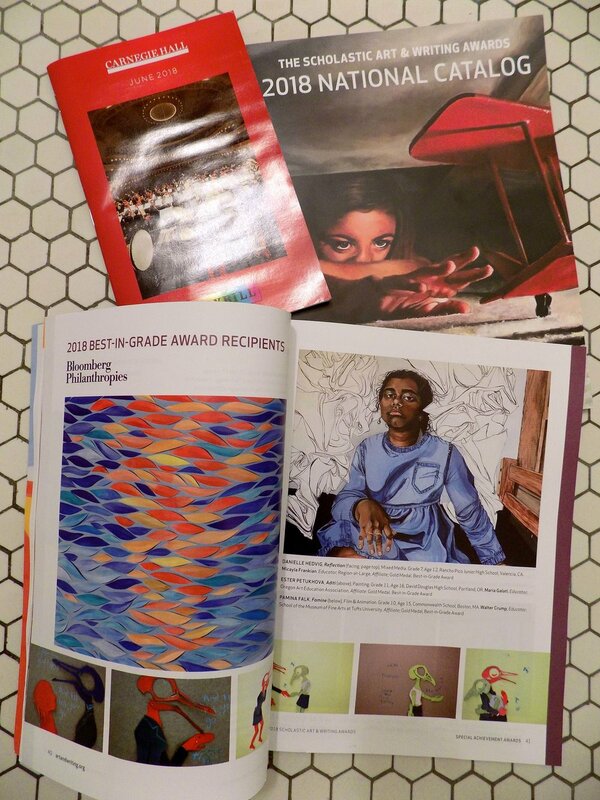 The Scholastic Art and Writing Awards are the nation's longest-running and most prestigious recognition program for creative teens. This year a record 347,000 works of art and writing were submitted for judging, with 800 students invited to be recognized for their accomplishments at Carnegie Hall. Scholastic entries are judged for their technical skill, originality and emergence of personal voice or vision. Ester joins the ranks of Awards alumni which include artists Andy Warhol, Richard Avedon and John Baldessari, and writers Sylvia Plath, Truman Capote and Stephen King. The DDEF is so pleased to have helped Ester's dream trip come true.